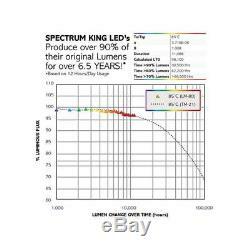 Full spectrum Spectrum King LED grow lights are full spectrum white; mimicking the radiation plants would receive from natural sunlight. This light output is optimal for growing, leading to increased yields and healthier plants. The white light is also gentle on your eyes, eliminating the need to use LED glasses to protect your eyes from the dizzying red and blue lights. Low power consumption The super-bright SK602 with a power consumption of 640W uses almost half the electricity compared to the equivalent double ended HPS 1000W grow light. Based on light output and grow area the light covers, it beats double CMH fixtures and , this light is about the equivalent of a 1000W dual ended HPS with a power consumption of about 1200W. High Output The Full Spectrum 602SK LED light yields an impressive 114,345 LUX and a PAR reading of 3000 at a height of 30cm. Coverage area The Spectrum King SK602 can be used for both veg and bloom grow stages, and offers a 1.5 x 1.5m bloom coverage area and a 2.4 x 2.4m veg coverage area. Effective Heat Management Spectrum King utilises premium quality heat sinks, negating the need for noisy cooling fans in the LED lights, which in turn helps save power. 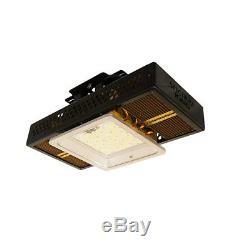 The lights give out minimum heat radiation, which will be a massive benefit during Australian summers. To reduce the heat load further, our SK602 models come with a dimmer to reduce the energy usage, power consumption and hence heat. Waterproof All Spectrum King LED grow lights are rated IP65, meaning that they are dust proof, as well as low pressure water proof. In other words, you will be able to hose off your grow light to clean it. It is also perfect for using outdoors, in humid conditions and in the presence of foliar sprays. Their own tests have shown that their light output will remain above 90% of the original brightness for the first 30,000 hours of use (which equates to 6.5 years of 12 hour daily usage), and above 80% for the first 62,000 hours. For expert advice, or general enquiries, please get in touch with our experienced staff. Spectrum King LED grow lights are full spectrum white; mimicking the radiation plants would receive from natural sunlight. The super-bright SK602 with a power consumption of 640W uses almost half the electricity compared to the equivalent double ended HPS 1000W grow light. 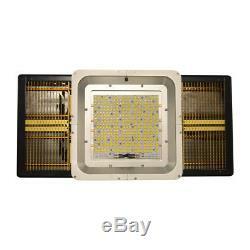 The Full Spectrum 602SK LED light yields an impressive 114,345 LUX and a PAR reading of 3000 at a height of 30cm. The Spectrum King SK602 can be uséd for both veg and bloom grow stages, and offers a 1.5 x 1.5m bloom coverage area and a 2.4 x 2.4m veg coverage area. Spectrum King utilises premium quality heat sinks, negating the need for noisy cooling fans in the LED lights, which in turn helps save power. All Spectrum King LED grow lights are rated IP65, meaning that they are dust proof, as well as low pressure water proof. Light beam angle - 120º. No fan - no noise. 3 Year >90% Light output. Dimensions: 30.5cm x 25cm. Coverage area: 2.4m x 2.4m Veg and 1.5m x 1.5m Bloom. Full Spectrum - Appears as white light. Comes with 3m power cord. 2 large eyehooks for hanging. We are only responsible for the items within Australia. Want to get updates on the latest news? 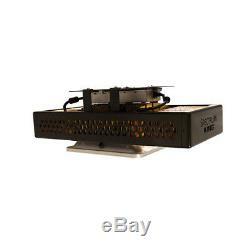 The item "Spectrum King LED 120 Degree SK602 Full Spectrum LED Grow Light" is in sale since Sunday, October 15, 2017. This item is in the category "Home & Garden\Yard, Garden & Outdoor Living\Gardening Supplies\Hydroponics & Seed Starting\Grow Light Kits". The seller is "aqua-gardening-australia" and is located in Brisbane, Queensland.